I am immensely proud of these little beauties. This is the kind of mid afternoon pick me up I crave with a cup of tea. They are a little sweet, moistly dense (think brownie), and crunchy on the top. Yes these hit the spot nicely…very easy to go back for a second or third. Preheat the oven to 180 degrees, mash the bananas with the oil, yoghurt, butter and oil. Add the vanilla extract and the sugar. Beat together to combine. Now beat in the eggs. Sift the flour with ground almonds, baking soda, baking powder, sea salt. Fold these dry indredients into the wet mixture unitl no flour is left visibly white. Be careful not to overbeat this mixture. Pour the batter into the prepared muffin tins, sprinkle with sliced almonds. Bake in the oven for 18-20 minutes until cooked when a skewer comes out with hardly any crumb. Leave to cool five minutes in the tin then place on a cooling rack. Serve warm. When caught out hungry I can be a right grouch. My husband jokes we need to keep a mini snack box in the car just for me, his favourite line is ‘are you hungry again we just ate 3 hours ago’ I say ‘yes that was breakfast’. Call it low blood sugar levels but I really do need to eat quite regularly so am always planning out what I am going to eat next!. Cooking is a passion, but more thrilling is the joy of eating what I cook. The icing on the cake is serving that food up to my hungry, appreciative guests. When greedy silence descends on the table you know you have nailed it. My second daughter Evie Rosa was born on 19th September 2012. A second peaceful birth at home meant that I could get in the kitchen and cook some nourishing post birth meals. 2012 was a huge cooking year for me pregnant and with a new-born baby and I never got around to posting the photos and recipes I made. 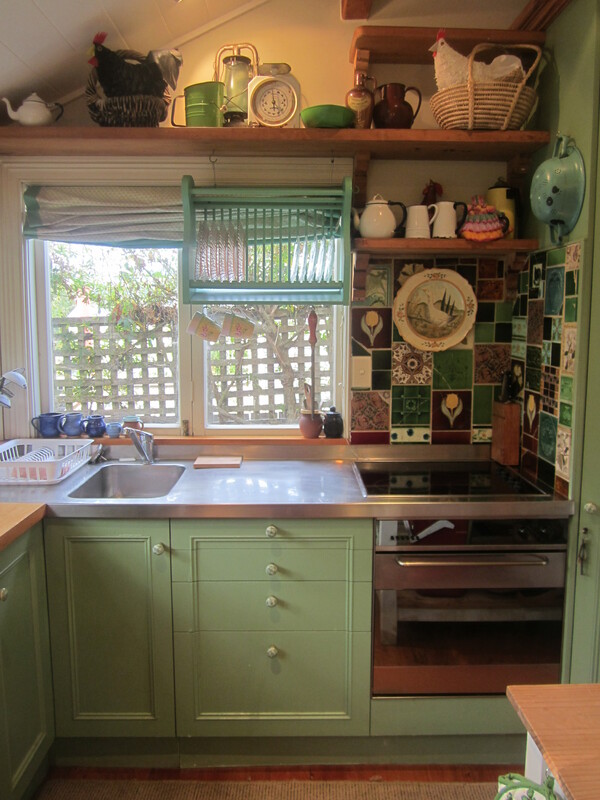 So here is a quick 2012 photo diary of some of the everyday meals that came out of my kitchen and were very joyfully received by my family and friends that never made it on to my blog. Crumbed, golden and glorious! 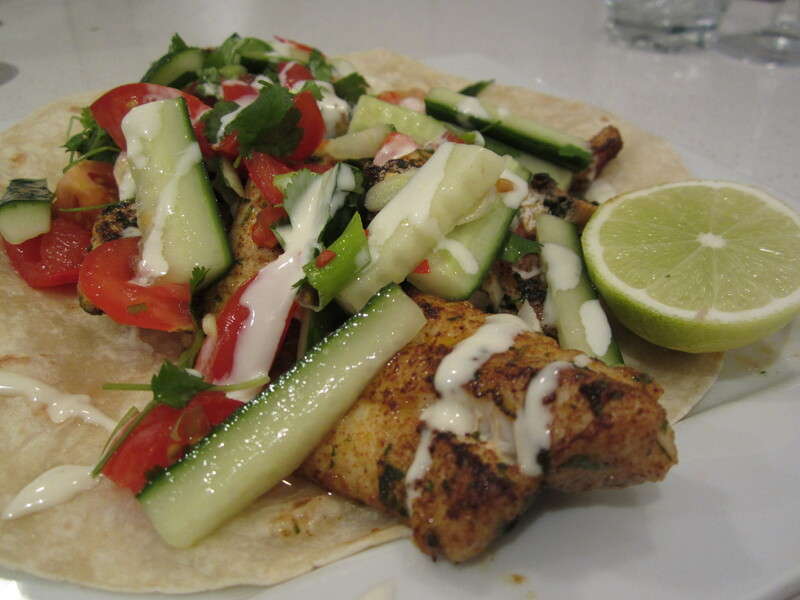 chicken, fish, haloumi cheese, there are so many options. I can never decide whats best fresh breadcrumbs, or ground macadamia, almond nuts, parmesan cheese, panko crumbs. Crumbed foods shallow fried in butter and olive oil, or the fat of your choice, find me someone who can resist this. Forever the reason my home has been affectionately nicknamed ‘fat camp’ from my friends and family. This recipe came from this book. A very easy chocolate cake that takes minutes to mix the batter. 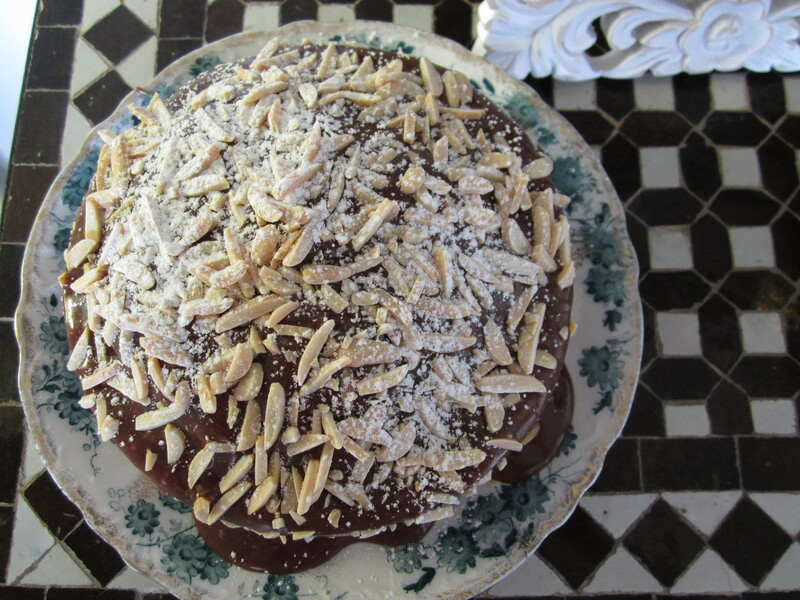 The almonds look so stunning contrasting against the glossy chocolate icing. I ate my fair share of rice and potatoes last year. 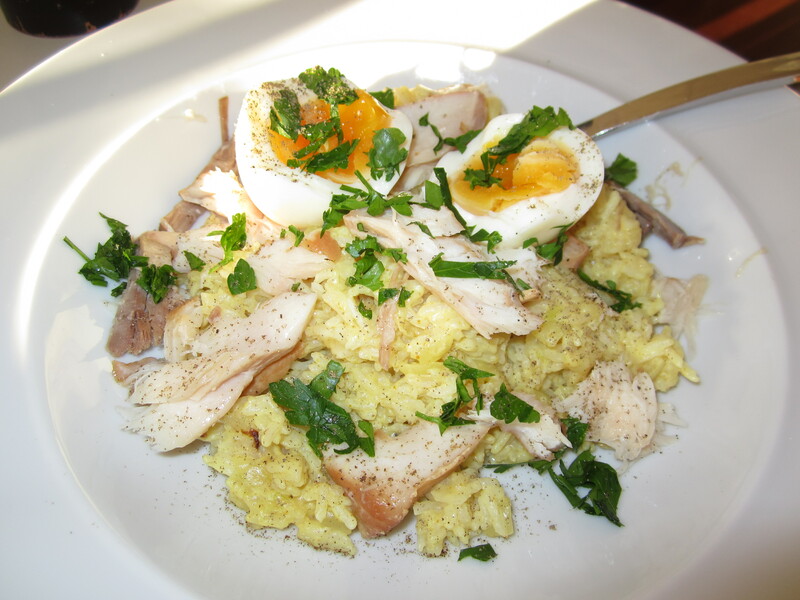 Fish kedgeree stared a few times. certainly a dish which is more than its sum of parts. 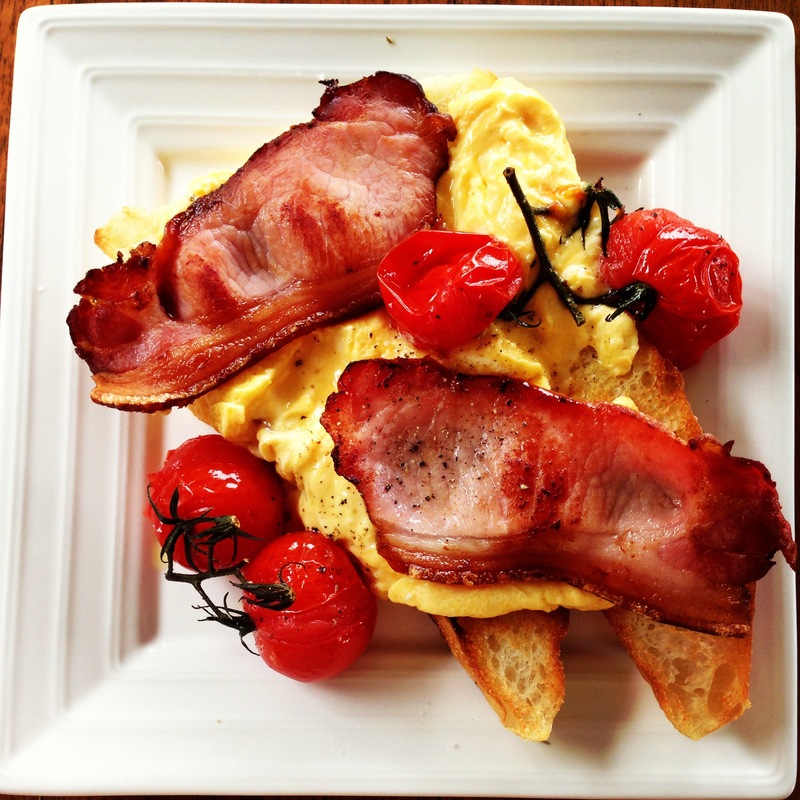 Breakfast, lunch or dinner – the perfect meal for anytime of the day. 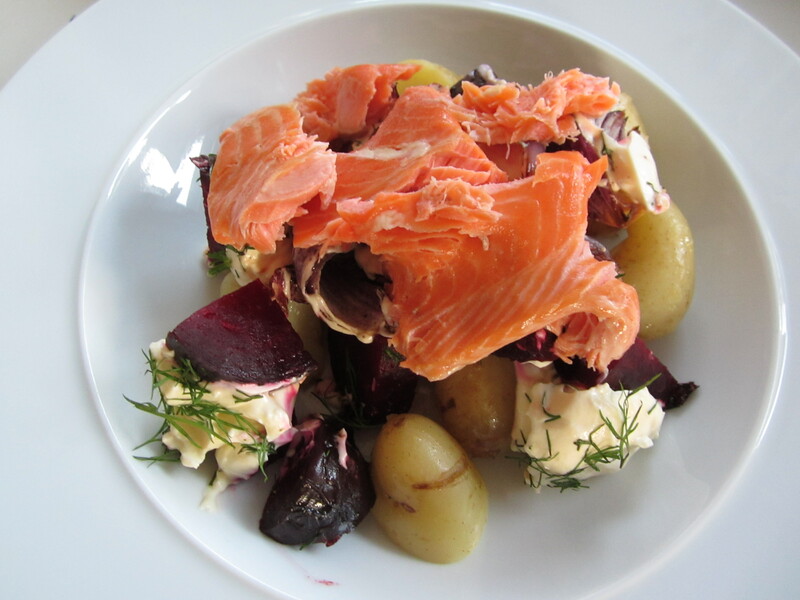 Nelson New Zealand Mapua smokehouse produces outstanding moist, sweet, oily smoked fish. It is swooningly delicious and never dry. I discovered Dulche De Leche. Why it has taken me this long to taste something this decadent from a jar. For once I praise industrial food. Thank you Argentina for Dulche De Leche. Right now you will fall into two camps. 1: you are nodding your head knowingly as you read this and have a secret stash of Dulche De Leche in your cupboard which you sneak spoonfuls straight from the jar when you need to mainline some pure sugar!. Oh its good. 2: If you have no idea what I am going on about. Please go to a specialty food imports store or online and buy some asap. 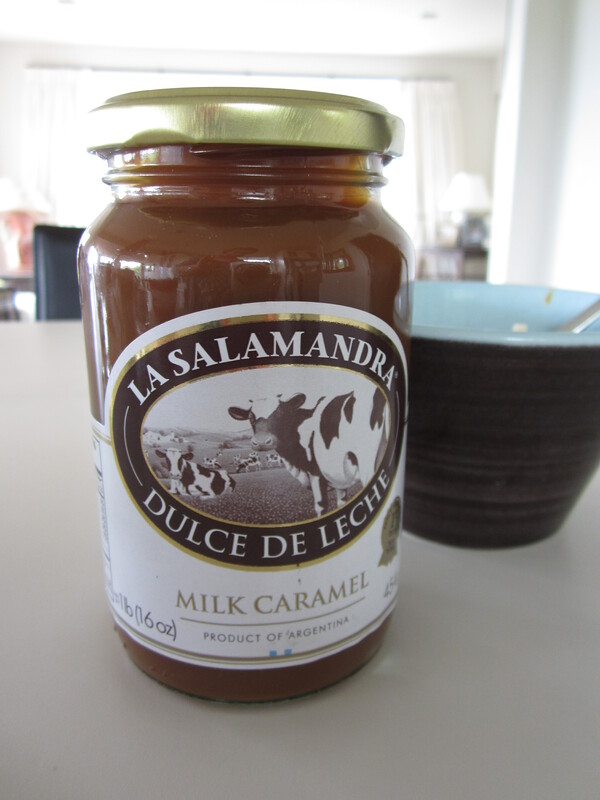 There are so many ways to have your dulche de leche – milk caramel sauce. I made a chilled vanilla rice pudding, I then mixed dulche de leche with some cream to thin it down and drizzled it all over the rice pudding. The only problem here is stopping at one bowl. We also enjoyed a banoffee style american pancake stash with bananas, softly whipped cream and dulche de leche drizzled. delicioso. 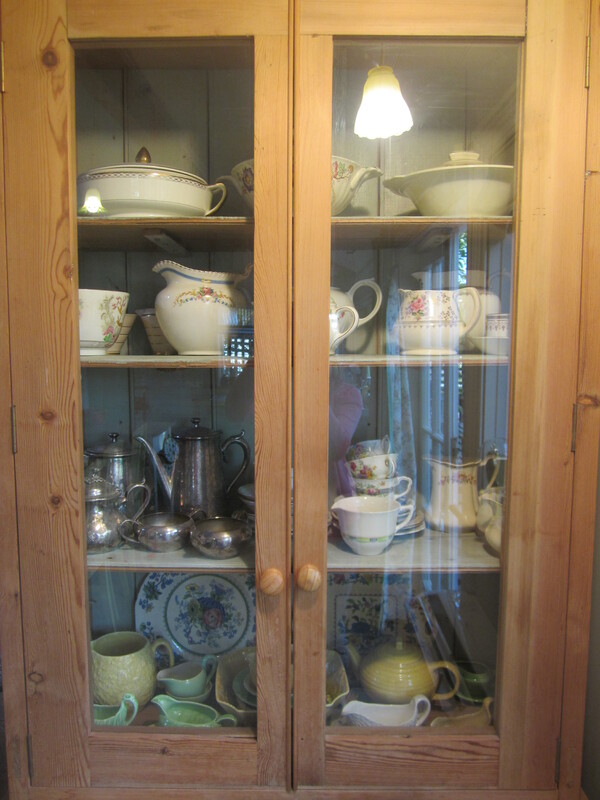 With all this cake eating going on in 2012 I have been thinking my pantry needs a health overhaul and it is time to get my kitchen whizzing up split green pea soups, quinoa salads, farro oyster mushroom rissottos, buckwheat pancakes with blackberries and bowls of steel cut oats. I cant wait to get cooking. A week ago I was craving the herb dill. My modest herb garden at home supplies me with my usual kitchen staples; flat leaf parsley, coriander, thyme, mint, sage and rosemary. However dill is one thing I do not currently grow. I managed to buy some from my farmers market and made some lovely meals infused with the fresh uplifting aniseed taste, fennel fragrance of this under used herb. 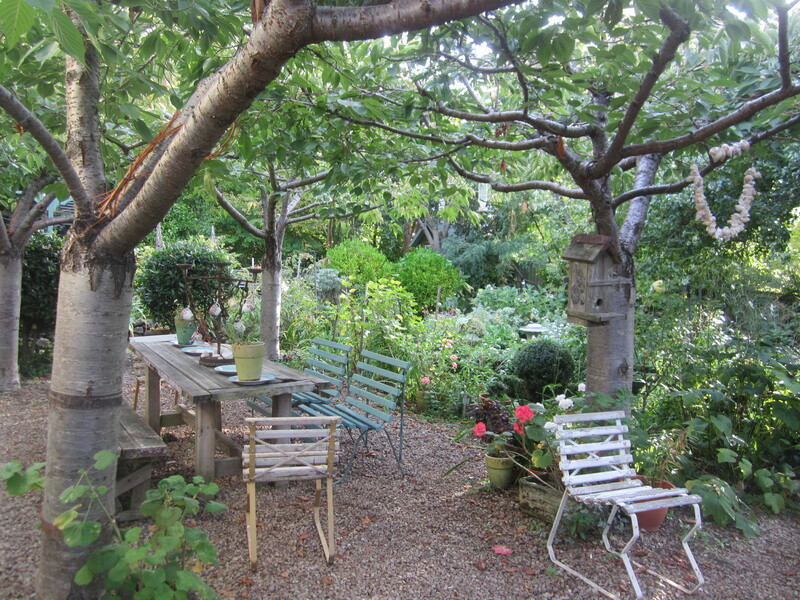 Its appearance is wiry thread like leaves which look so pretty sprinkled or stirred through a dish. 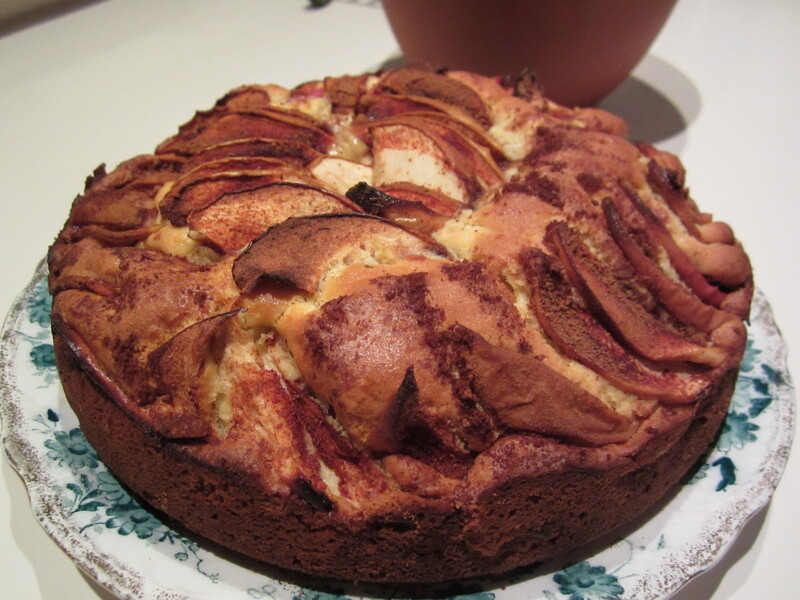 I have been cooking up a storm from cook book writer Diana Henry. This idea came from her book effortless cooking http://www.bookdepository.co.uk/Cook-Simple-Diana-Henry/9781845335748 I have cooked about 15 recipes from this book in 3 weeks, I highly recommend it for a good variety of everyday recipes that are simple yet full of flavour. There are still bags of beetroot for sale at the farmers markets and it makes me feel virtuous to feed freshly roasted beetroot to my family especially as I am sure I am doing something special for my husbands poor liver after too much winter wine drinking. I had to share this recipe as it was very easy to put together and can be easily assembled and eaten at room temperature. 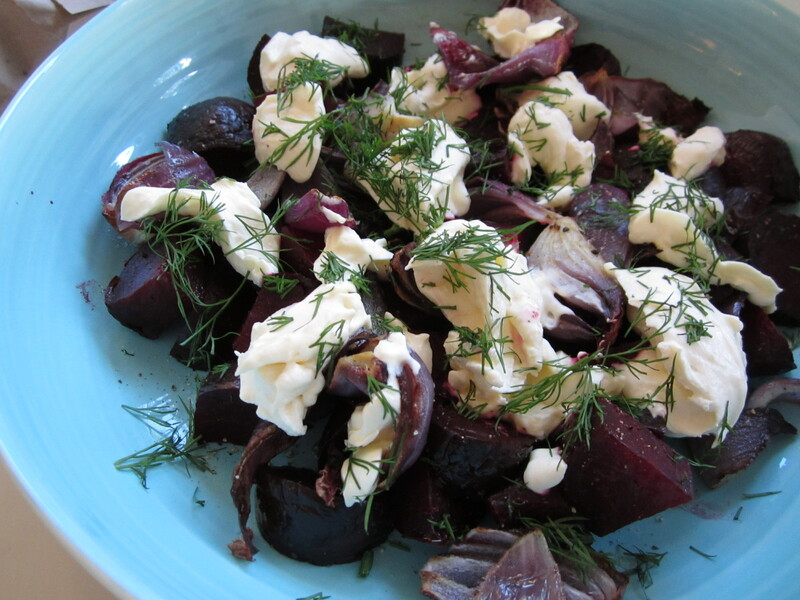 To make the beetroot you will need: 750 grams raw beetroot (try to get small ones if possible), 4 tbsp olive oil, sea salt and pepper, 2 red onions, 150 ml sour cream, 1 tbsp chopped dill. 1: Wrap the unpeeled beetroot in a foil parcel, drizzle with half the olive oil, season and put in a roasting tin. Cook in an oven preheated to 180 degrees until tender. (How long this takes depends on the size of your beetroot) – it could take as long as 1-2 hours. Put the onion wedges in a small roasting tin, drizzle with the rest of the olive oil, season and roast in the same oven for 20-30 minutes. The onions should be tender and slightly singed at the tips. 2:When the beetroot is tender, peel each one (or leave the skin on as I have in the picture above) and quart or half depending on their size. Season the beetroot and put on a serving dish with the onions. Daub the sour cream over the vegetables and sprinkle with the dill. Serve hot or at room temperature. 3: I boiled new small waxy potatoes for 15-20 minutes until tender and added a little butter to warm through them. To serve I placed the potatoes in wide shallow pasta bowls, spooned the beetroot & onions on top and placed some chunks of smoked salmon on top. Very Scandinavian!. 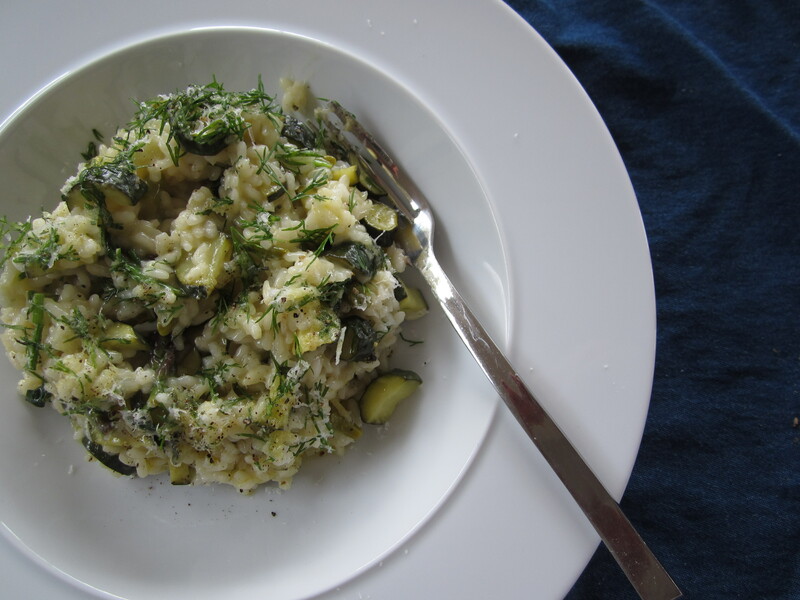 With a little fresh dill leftover I made a spring green risotto the next night with courgettes, asparagus and dill. This was lovely for a change to my usual risotto. Fresh, clean and zingy flavours hit all the right notes for dinner tonight. It has been a biting cold day in Christchurch, New Zealand. I have not really been enjoying the typical winter fare we all end up cooking in the depths of winter; slow braises and stews, lazy pastas, big-hearted soups, red meat & roasts. I just felt like something cleaner, lighter, easier and crunchier. Bill Granger is one of my favourite Australian cooks. 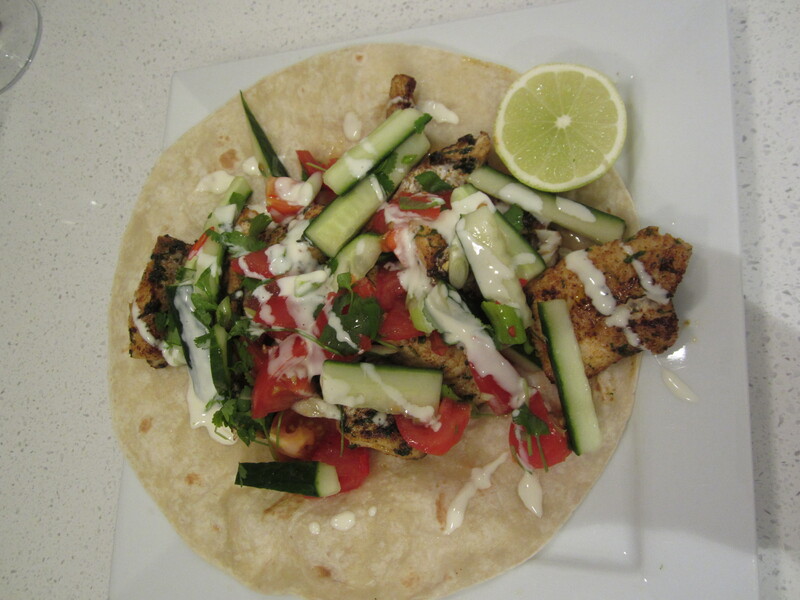 Naturally when this fish burritos recipe result came up on my blackberry screen in the car park of the fish shop I knew it would be good – it was. 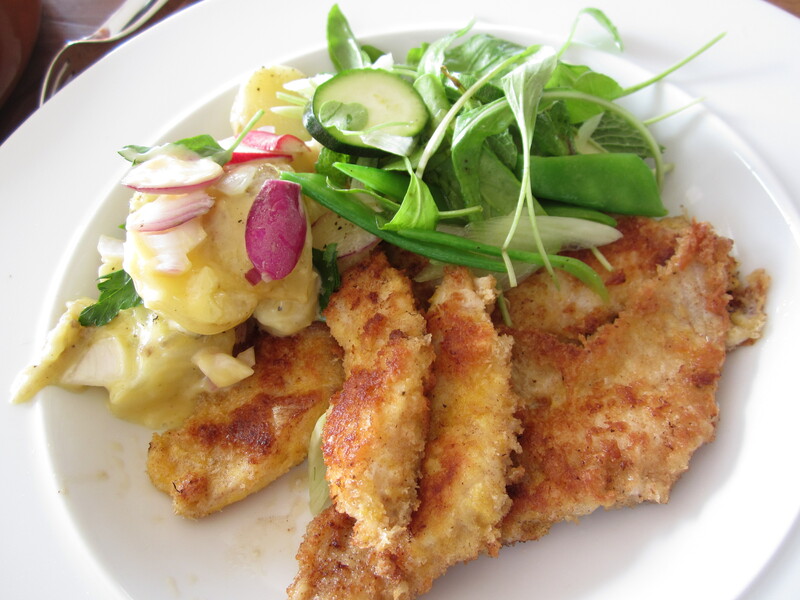 Place all ingredients except the fish in a blender or a food processor and process until a paste forms. Place the fish in a bowl, add the paste and stir to combine. Leave to marinate for 15 mins. Heat a non-stick frying pan over a high heat until hot, add some of the fish strips in a single layer and cook for 2 minutes. Turn and cook on the other side for 1 minute, or until the fish has been cooked. Remove from the pan and continue until all the fish has been cooked. Peel the cucumber and slice in half lengthways, remove the seeds with a teaspoon and slice into 5mm (1/4 inch) pieces. Place the remaining ingredients in a bowl and toss to combine. Place all the ingredients in a bowl and stir to combine. Refrigerate until needed.